Reviews are key to any carpet cleaning franchise business. Oxi Fresh is proud to have over 100,000 reviews on our website averaging at 4.6 out of 5 stars. That’s a world-class ranking. Yet that isn’t the only review milestone Oxi Fresh has reached recently. The Franchise Business Review placed us in their 2017 Top Franchises Report! But what does that have to do reviews? Everything. The Franchise Business Reviews is one of the only industry rankings that is based on franchisee responses. Where most lists look at system wide data – which is still very important – the FBR instead surveys thousands of franchisees in over 300 different brands. The FBR asks 33 benchmark questions designed to provide valuable insights into the health and strength of the brand. The questions touch on training, support, product development, the internal community, the company’s core values, and much more. Based on how the franchisees respond, the FBR calculates the Franchisee Satisfaction Index (FSI) for the brand. “Franchisee satisfaction ratings show you whether or not a franchise opportunity is really as good as it appears,” said the CEO of Franchise Business Review, Eric Stites, “and fits your values and vision by providing insight into a system’s culture, training, leadership, financial outlook, franchisee community, and much more.” Oxi Fresh is proud to say that our franchisee’s answers earned us a spot in the 2017 rankings. This is a validation of all the hard work that we put in, work that’s designed to help our carpet cleaning franchises to succeed. “We’re always happy to see our names in these industry lists and rankings,” said Vice President Kris Antolak, “We’re proud of the system we’ve created, a carpet cleaning franchise built both on environmentally friendly solutions and advanced business technology.” One of the systems Mr. Antolak refers to is our national Scheduling Center. 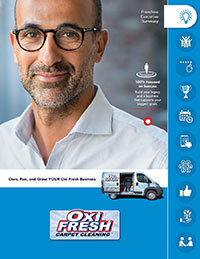 Rather than having franchisees answer their own calls in the field, Oxi Fresh operates a national Scheduling Center that takes care of all of that for them. By handling their calls, Oxi Fresh ensures that the entrepreneurs in our system can focus on growing their franchise instead of getting stuck just operating it. This is just one example of the many services Oxi Fresh provides our franchisees. Of course, just because we earned a spot in the 2017 rankings does not mean that Oxi Fresh is resting on its laurels. We’re already looking for new ways to provide our franchisees with additional services and programs. “We never stop looking for ways to improve,” said Mr. Barnett, the company’s president, “My goal is to make our carpet cleaning franchise opportunity the number one choice for entrepreneurs out there and to leave our franchisees extremely satisfied, year in and year out.” To read the original article about Oxi Fresh’s ranking, go to: www.oxifresh.com/news/oxi-fresh-carpet-cleaning-2017-franchise-business-review. To learn more about how Oxi Fresh can help you become your own boss, go to: www.oxifreshfranchise.com.